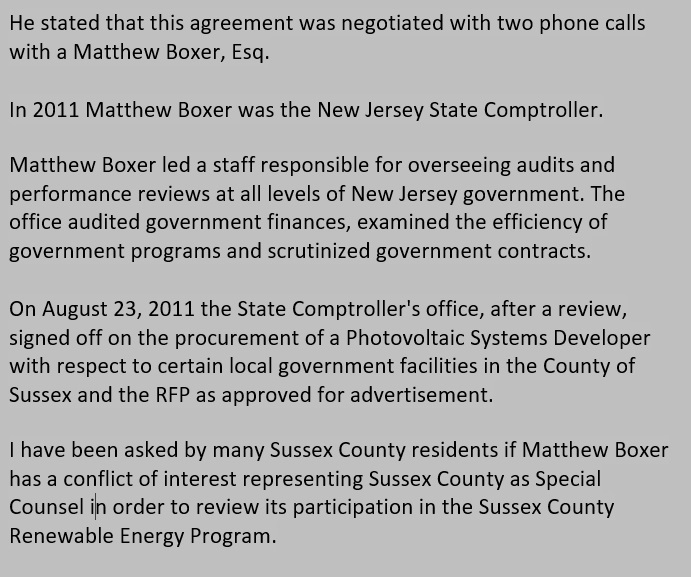 The Office of the State Comptroller's recalcitrance to share the review that they had already conducted or to take that review further was a loss to the taxpayers of Sussex County, but a boon to former State Comptroller Matthew Boxer, who was now being touted as the only man to do a review that was to be paid for by fresh taxpayer's money. To this day, this Freeholder -- a respected member of the community in Sussex County and a veteran of the Korean War -- has never received the courtesy of a reply. Why not? The word "facts" is used when "representations" might be more appropriate. As the State Ethics Commission did not conduct its own review of the Office of the State Comptroller's "records and emails... correspondence... other documents", it is clear that they are simply accepting Mr. Boxer at his word. Doesn't it seem strange to claim that the person in charge of an office was so lax as to have no knowledge of what was a three-county project involving -- to start -- $100 million. And that his office reviewed nearly a dozen similar contracts involving many more millions in public money. Okay. let's accept that Mr. Boxer was a "delegator" without direct, day-to-day knowledge about the office he was responsible for. How did he come to be recommended as the sole recipient of a $500,000 contract to review what his office failed in reviewing at the start?